This course can be done after completing the 50m Air Class II. 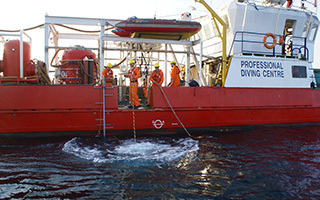 The 70 metre Surface Mixed Gas diver is a course training a diver to use mixed gas surface supply to a maximum depth of 70 metres. This course is not commonly run course, as not many companies use this method of diving, therefore these courses are run on demand. This class II M course is not a prequisite for the Class I saturation closed bell diver course. The qualification allows the diver to use nitrox, heliox and trimix, using in water oxygen as well as surface decompression procedures with and without the use of a diving basket and wet belt. Wet bells are use in the heliox depth range. Location: Durban South Africa. 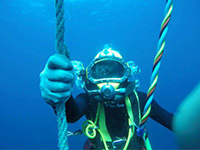 Training will be done in both fresh water and open sea conditions. There is so much more covered than what is listed above as well.